The land hermit crab lives most of its life on land and wears the abandoned shell of a dead land or sea snail to stay safe. It is native to the warn shores of the western Atlantic and Caribbean, from southern Florida to Venezuela. 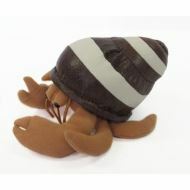 The land hermit crab is a popular pet. Since it lives on land, it is much easier to care for than a marine hermit crab. The crab is about 1-1/2 inches long and can live ten years or more.